Large, flexible storage containers are useful in a number of applications and industries. Construction sites and emergency services may use them as part of a flood barrier system, while landscapers and contractors may need large erosion control bags in their projects. 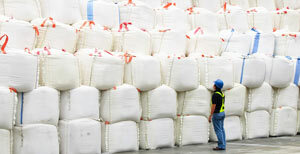 Many bulk bag suppliers have bulk bag stock that is made in china or made from recycled parts. GEI Works only sells FIBC bulk bags that are made in the USA with 100% virgin polypropylene. We also offer bulk bags in a variety of capacities, construction types, and dimensions so you can find the perfect size for your needs. Questions? Call the GEI Works team and ask about our gravel bags for erosion control at 1-772-646-0597 or fill out our quote request form. Bulk bags are available in two fabric options: polypropylene-coated or uncoated. Coated bulk bags prevent contents from sifting and disallow moisture from seeping through. 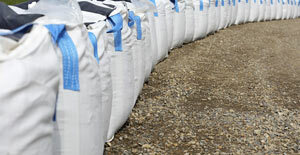 A flood barrier system or a wall of large sandbags would need coated bulk bags to hold back any water. For breathability and filtration, uncoated bulk bags are the right choice. 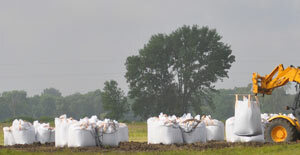 For example, gravel bags for erosion control ideally use uncoated fabric. Bulk bags also come in three construction types: U-Panel, 4-Panel, and Circular. U-panel construction uses one long piece of fabric for two sides and the bottom with 2 additional pieces as the remaining sides. The 4-panel model has four separate fabric pieces for sides, while the circular uses one continuous piece for all sides. The number of seams determines how well each bag keeps the standard square shape in- filled, as well as the bag's susceptibility to seam failure. Bulk bags also have different types of top and bottom openings for filling and emptying. Bag construction model generally determines the available top and bottom openings. Questions about 1 ton bags for sale? We can help! 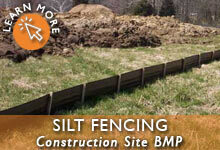 Call the GEI Works team at 1-772-646-0597 or fill out our quote request form. Need a smaller option? Take a look at our Gravel Bags. 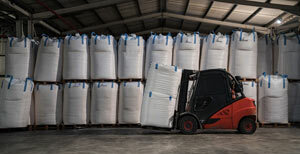 Looking for a bulk bag supplier? Call GEI Works at 1-772-646-0597 or fill out our quote request form.